APRIL 20--A new series of witness statements released by the Federal Aviation Administration reveal just how close construction workers came to being struck by Senator James Inhofe’s plane last October when the politician landed his Cessna on a closed runway at a south Texas airport. 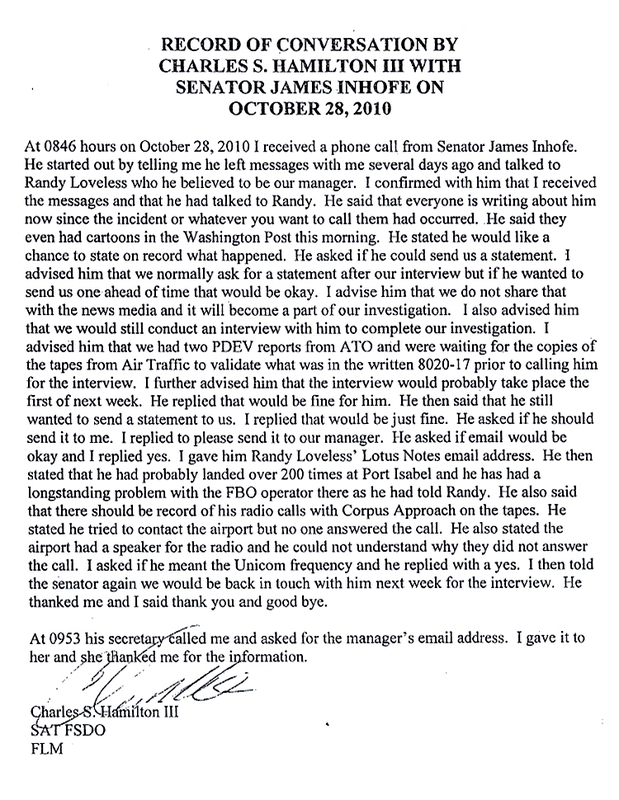 Additionally, other documents provided in further response to a TSG Freedom of Information Act request show that, in the face of a probe of the reckless landing, Inhofe used Senate employees and his Tulsa, Oklahoma district office to help prepare responses to the FAA inquiry. 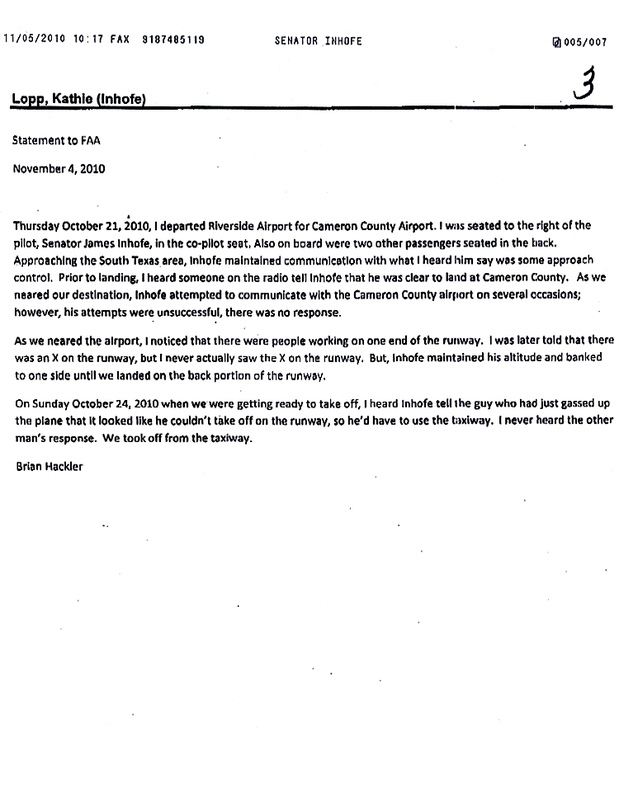 As previously reported, Inhofe, a third-term Republican, came under FAA investigation after he “sky hopped” over a construction crew repairing a closed runway--which was marked off by a large yellow ‘X’ at its threshold--at the Cameron County Airport in Port Isabel. The 76-year-old politician was en route to nearby South Padre Island, where he owns a vacation home. 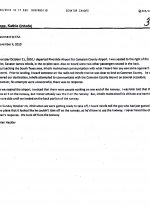 Inhofe was traveling with a family friend and two staff members. 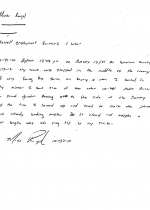 In handwritten statements provided to FAA investigators, three laborers working on the closed runway gave eyewitness accounts of the dangerous landing by Inhofe, who holds a commercial pilot’s license. G.W. 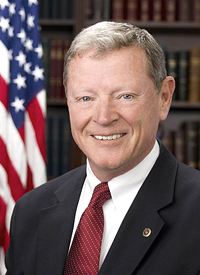 Hanson, a construction foreman, said that when he realized Inhofe’s twin-engine plane was coming in for a landing, he ran onto the runway to get the attention of two workers “by waving my arms jumping and yelling.” As he did this, Hanson noted, Inhofe’s plane passed “directly over my head approx. 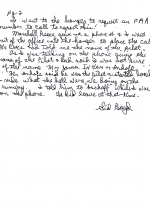 10 feet.” Hanson added that, based on the dust and debris kicked up, the Cessna appeared to have touched down and then “lifted up and swerved around” the laborers. 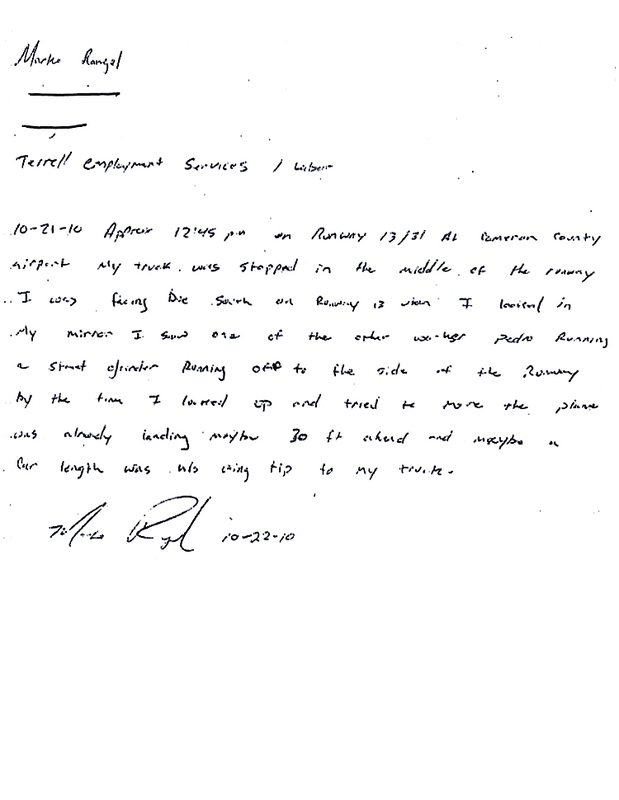 Worker Marko Rangel, who was sitting in a truck “stopped in the middle of the runway,” recounted how he first realized something was amiss when he looked in his vehicle’s mirror and saw a worker (who had been operating a street grinder) “running off to the side of the runway.” Before Rangel could move, Inhofe’s plane was landing, with its wing tip “maybe a car length” away from his red Dodge. 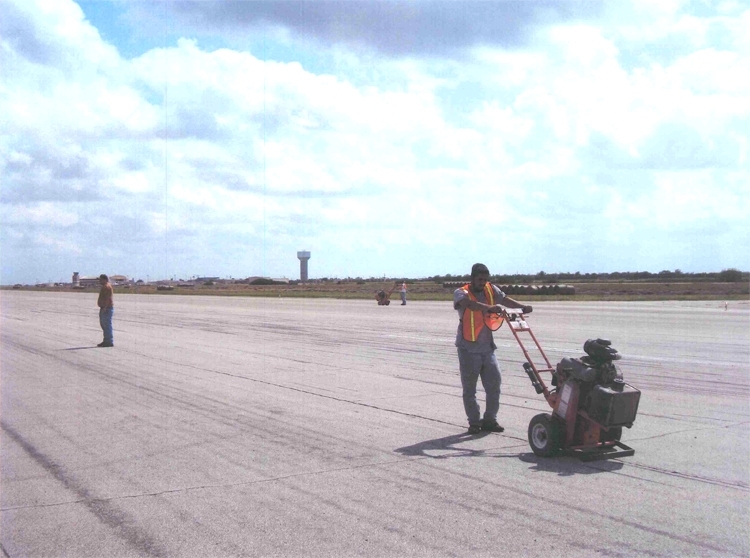 Alejandro Torres, the laborer using the street grinder, stated that he was in the middle of runway 13 when he looked backwards and saw Inhofe's plane. 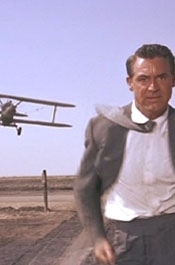 "I had to grab my machine and take off running north of the runway with it,” Torres recalled, adding that Inhofe “came and touched down throwing gravel and rocks all over me.” He added that Inhofe “then had to get right back up to avoid from hitting” Rangel’s truck. 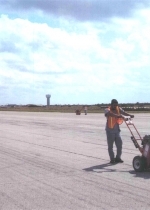 A photo included in the FAA documents shows three workers on the Port Isabel runway. Two men are wearing reflective safety vests and operating pavement grinders. As TSG previously reported, Sidney Boyd, a construction supervisor, used the term “sky hopped” to describe Inhofe’s hopscotch landing. 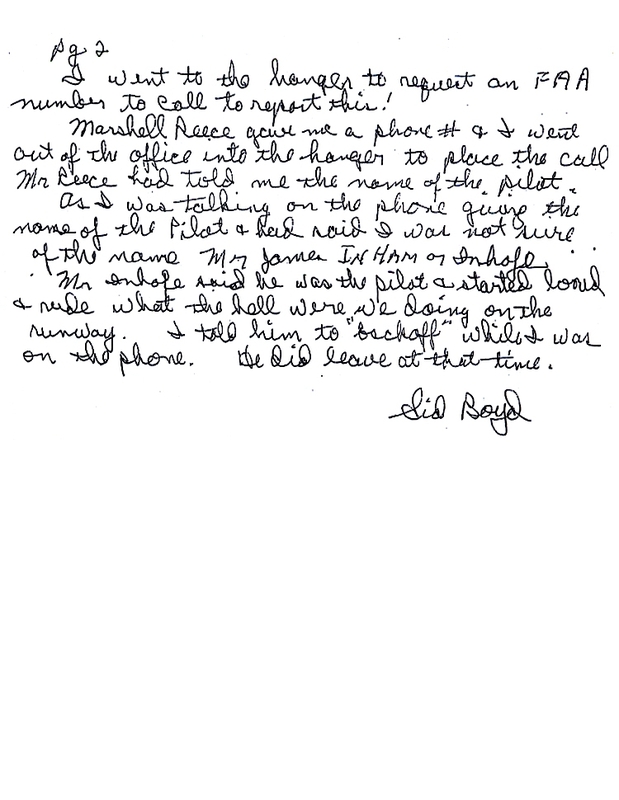 In a written statement, Boyd said that he was on the phone with an FAA representative reporting the dangerous landing when Inhofe became “loud and rude” and demanded to know “what the hell were we doing on the runway.” After telling the politician to “back off,” Boyd said Inhofe departed. 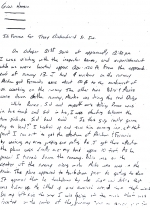 The second batch of FAA records provided to TSG contained documents that were faxed to aviation investigators from Inhofe’s Senate office in Tulsa. 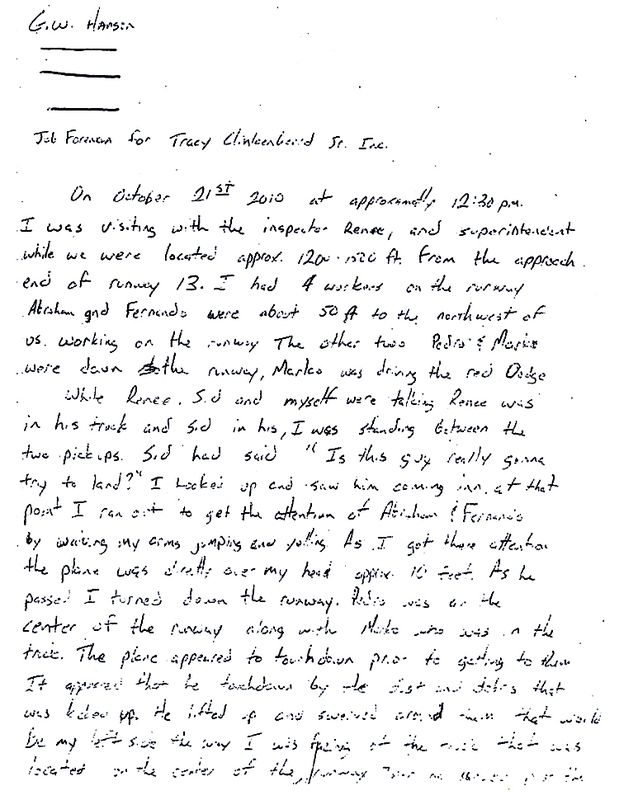 This material included brief written statements from the two staffers who were passengers on the Cessna, as well as flight logs and repair and inspection records for the politician’s six-seat plane. 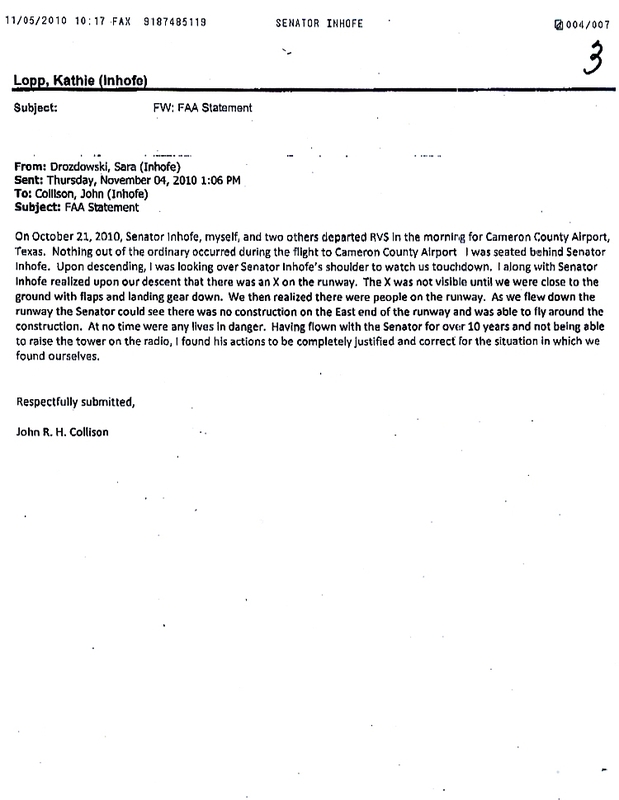 The statement from Collison, who works as Inhofe’s Oklahoma state director, was, like the other documents, faxed to the FAA on November 5. 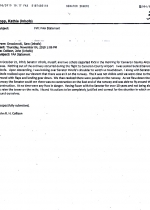 It apparently was printed out from Lopp’s e-mail account, where it had been forwarded by another Inhofe staffer, Sara Drozdowski, a district staff assistant. 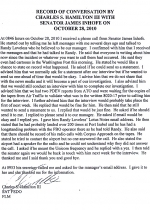 FAA records also include an internal memo memorializing a telephone conversation Inhofe had with Charles Hamilton, a flight standards official, a week after the October 21 landing. The senator reported that “everyone is writing about him now” due to the landing, and that “they even had cartoons in the Washington Post this morning.” Inhofe, who said he wanted to submit a statement to the FAA, reported that he had landed “over 200 times at Port Isabel and he has a longstanding problem with the FBO operator there.” The airport’s fixed-base operator, or FBO, is responsible for managing the facility. Submitted by excellent justice on Fri, 2011-04-29 12:14. Submitted by Loveourvets on Sun, 2011-04-24 00:29. 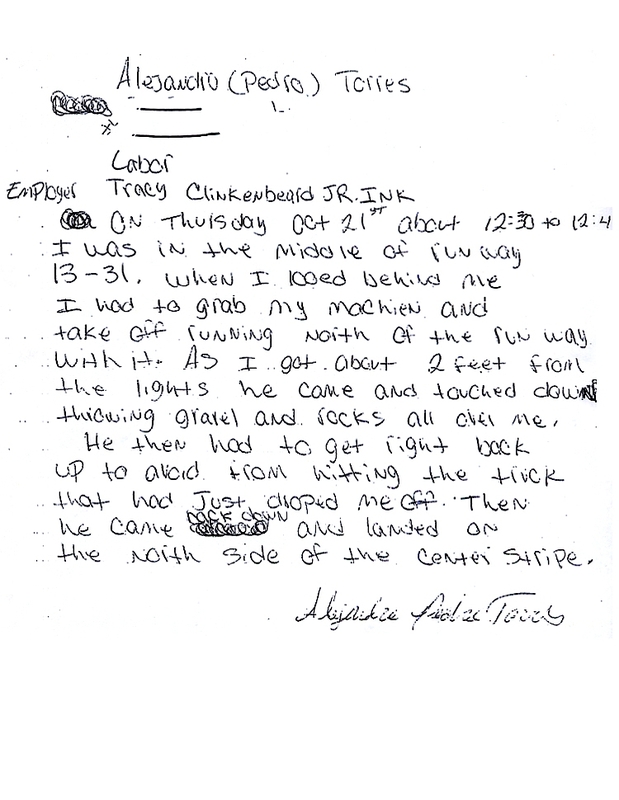 Well, he did manage not to hit anyone, so ya' gotta give him that. Either he's a very bad pilot or a very good one. Hey....maybe, he mistook Marko Rangel for Congressman Charles Rangel and he was aiming for him, but missed. Submitted by fulanomengano on Sat, 2011-04-23 21:06. None of the statements are signed and it obvious that Mr Collison's statement has not been approved by him since he is only a recipient of that email not the one who sent it. That these documents were accepted as part of an investigation into a serious matter as this one is a very worrsiome sign. Submitted by tarheelcoin on Sat, 2011-04-23 08:57. Submitted by skyking on Fri, 2011-04-22 21:27. As a Gold Seal flight instructor for over 40 yrs; what I have just read is a flagrant violation of FAR91.103 PREFLIGHT ACTION. This regulation is one that I stress to all who will listen. However, it seems that Politicians can get away with anything. In this case it was attempted manslauder. I believe this illigal act committed by the senator, is grounds for a defense for us if we commit such an act! Submitted by Marisa on Fri, 2011-04-22 14:35. James Imhofe - a true OKIE asshat!!!! Submitted by jhnnywalkr on Thu, 2011-04-21 12:10. "DO YOU KNOW WHO I AM?!?!" What a [email protected]$$. Submitted by Mo Ma' on Wed, 2011-04-20 17:11. Why is he exempt from suspension of pilot privileges for his blatant and hazardous operation of a winged aircraft? Submitted by Chuckl on Wed, 2011-04-20 16:22. As a commercial pilot for the past 47 years, I can guarantee that if I or any other "regular" pilot had done this, with this much critical documentation, we "wouldn't simply be receiving some remedial flight instruction." This would normally result in a minimum suspension of pilot privileges for a significant period of time or revocation of his certificate. However, the FAA Re-Authorization bill is struggling in Congress and I'm sure the administrator of the FAA doesn't want to "ruffle the feathers" of Senator No Global Warming. Submitted by Working Liberal on Wed, 2011-04-20 15:34. Public servant my arse. He, like most politicians from both sides is a jerkoff. Submitted by DexterTheCereal... on Thu, 2011-04-21 06:15.